LOCATION.--Lat 40`15'17", long 76`53'11", Dauphin County, Hydrologic Unit 02050305, on east bank of City Island, 60 ft downstream from Market Street bridge in Harrisburg, 3,670 ft upstream from sanitary dam, and 1.7 mi upstream from Paxton Creek. PERIOD OF RECORD.--October 1890 to current year. GAGE.--Water-stage recorder and heated tipping bucket precipitation gage. Concrete control since Aug. 29, 1916. Datum of gage is 290.01 ft above National Geodetic Vertical Datum of 1929. 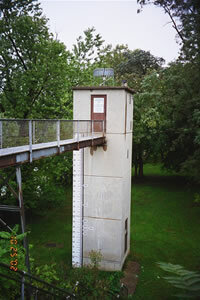 Prior to Oct. 1, 1928, non-recording gage at Walnut Street Bridge 600 ft upstream, and Oct. 1, 1928, to Aug. 31, 1975, water-stage recorder at site 3,170 ft downstream, all gages at same datum. COOPERATION.--Station established and maintained by the U.S. Geological Survey. Funding for the operation of this station is provided by Exelon Generation, the Pennsylvania Department of Environmental Protection and the U. S. Geological Survey. REMARKS.--Water temperature data collection at the City Island site was discontinued on March 25, 2015. WATER QUALITY DATA FROM THE WALNUT STREET PIER LOCATION IS SEASONAL AND IS NOT TRANSMITTED VIA SATELLITE TELEMETRY AND THEREFORE WILL ONLY BE UPDATED ABOUT EVERY 6 WEEKS. Water-quality parameters at this station can vary substantially at different locations in the river. Therefore, water-quality data displayed here characterizes conditions only at the location where water-quality equipment is deployed. Supplied by NWS: Action stage 11 ft, recreational use of City Island begins to be curtailed; river interests should monitor conditions; Flood stage-17 ft, basements of residences and businesses on both banks flood; the parking lot of City Island begins to take on water; Moderate flood stage-20 ft, a number of homes in West Fairview, Dauphin and Harrisburg flood; Major flood stage-23 ft, evacuations are necessary in the Shipoke area of Harrisburg; the water level reaches the corner of Keller and Front Streets.